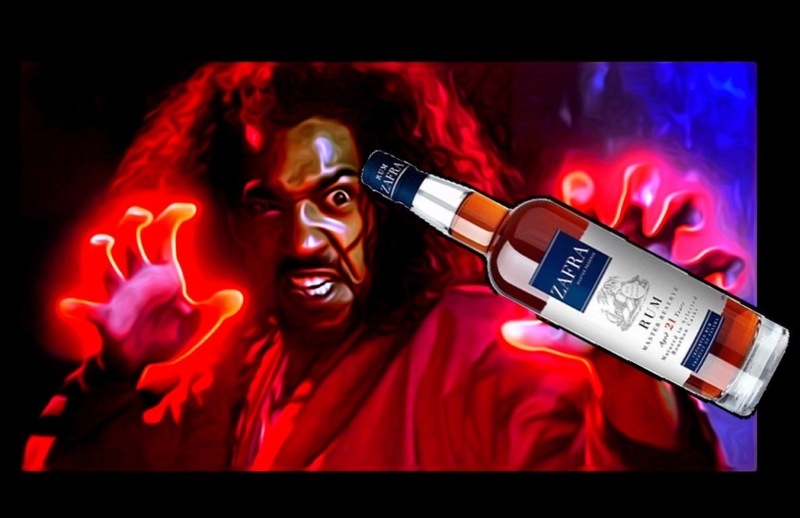 Have you found an online vendor selling Zafra Master Reserve 21? 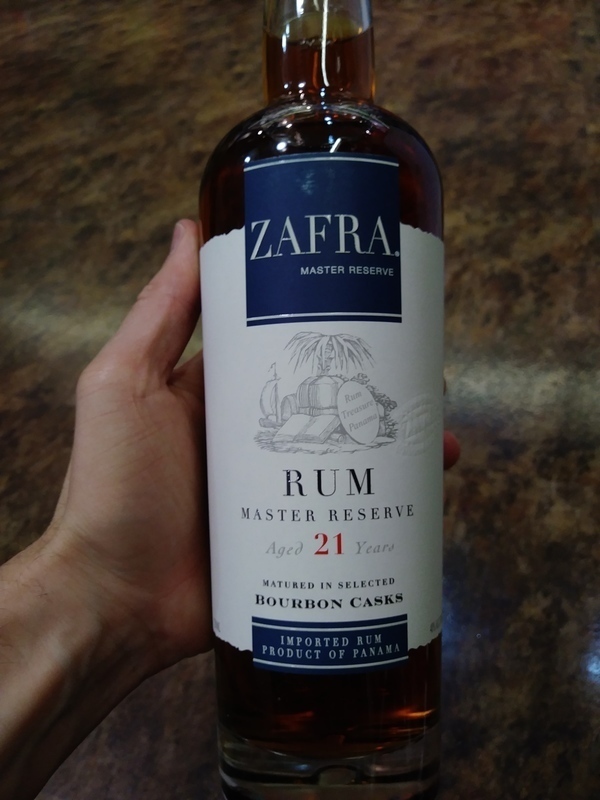 Zafra Master Reserve 21 is a premium rum distilled in Panama, at Las Cabras Distillery, by master blender Francisco "Don Pancho" Fernandez. The rum is made from molasses and aged in American bourbon barrels for at least 21 years. Zafra 21 year has very good flavors, but it is very dry, has a harsh burn and does not have the most pleasant afterburn. If you like dry rums, then you will like this one, and especially all the single malt whisky drinkers, you will love Zafra 21 year. Sho'nuff! This is where sweet rum drinkers start mellowing out a bit. Pleasant fruit smell with a hint of wood aroma. The taste has just the right amount of sweetness that can be enjoyed by both the sugar fans (Bruce Leeroy) and the dry rum drinkers (Shogun of Harlem). The wood flavor could be considered a little heavy for some but I think it keeps things interesting. The burn and after taste make for a great experience. Zafra 21 is a must have for any person who enjoys sipping rum. Great stuff. I just picked up a bottle of this rum in Key West after discussing it with Bahama Bob Leonard. I got it home and tasted it for the first time and I absolutely love it. It is a very smooth rum with great flavor. I almost gave it my 2nd 10. After a few more sessions with it, I may just have to do that. It tastes like what I feel a great aged run should taste like; subtle yet intense in flavor and yet sweet without being overly sweet. Not as sweet as a Diplomatico or Zaya but not as dry as a Appleton or Mount Gay. I feel fortunate to have been able to purchase this bottle at the price I did for what I got in return. This rum reminded me very much of El Dorado 21. In fact, I struggled to differentiate them in a blind tasting. Ultimately, the El Dorado 21 is a little better, but not by much (I'm rating them both the same). But at half the cost of the El Dorado 21, this is a bargain! It has oak, spice, honey, and tastes nice, though I'd prefer just a tad more sweetness. Sehr netter Rum vom Meister Fernandez. In der Nase trocken Früchte, Karamell, etwas herbe Kräuter und ein wenig Holz. Im Gaumen auf einem rauchigen Holzbrett geschnittene reife tropische Früchte mit Vanillepudding und Karamell-Sauce. Im Abgang schön geschmeidig und langanhaltend, eine dezente Süsse wie bei einer zartbitter Schokolade. Ein durchaus süffiger Rum auch für Einsteiger. Very nice rum from the master Fernandez. In the nose dry fruit, caramel, some tart herbs and a little wood. In the palate, on a smoky wooden board cut ripe tropical fruits with vanilla pudding and caramel sauce. In the finish, beautifully supple and long-lasting, a subtle sweetness like a dark chocolate. A very tasty rum also for beginners. I find the Don Pancho 18yo much better in this price class. Has a more voluminous body and is much more complex. Primero abuelo ahora este ron zafra en una presentacion sencilla, pero hasta ahí llega su sencillez uno de los rones más complejos que he probado con un aroma dulce pero no empalagoso, con un sabor extraordinario saltan las almendras frutos oscuros y la madera Añeja, es suave al paladar e igualmente sabroso si te lo encuentras en el camino llévatelo no te arrepentirás . I've been enjoying this rum. Kind of like Santa Teresa but with more oak and the dryness the wood brings. Very smooth, without relying on sweetness. The heat of the alcohol lingers and so I find myself enjoying it more with an ice cube. Představíme si 21 let starý panamský rum Zafra Master Reserve. Pojem Zafra pochází ze španělštiny a odkazuje na období, kdy se sklízí cukrová třtina. Na českých internetových obchodech se všude můžete dočíst, že tento rum “ uvedli na trh lidé, kteří stáli u zrodu a vývoje značky Zacapa“. Zdroj této informace asi nevystopujeme, ale obchody si tuto informaci houfně kopírují, přičemž se mi nepodařilo ani na zahraničních webech zjistit nic, co by tuto informaci potvrdilo. Krom toho, že tato informace je nejspíš blud, mám z ní i dojem klamavé reklamy. Pokud máte někdo informaci, která by spojitost se Zacapou potvrdila, rád svůj názor přehodnotím. Výrobcem Zafry je firma PILSA (Proveedora Internacional De Licores S. A.) a nejvýraznější personou, která za tímto rumem skutečně stojí, je master blender Francisco “Don Pancho” Fernandez Perez, který svou kariéru začal na Kubě, kde se v 70. letech vypracoval na ředitele Kubánského nápojového průmyslu. Ve své funkci pak pomáhal školit master blendery v lihovarech v zemích bývalého východního bloku, ale i v Kanadě nebo na Madagaskaru. Osvojil si i výrobní postupy při výrobě vodky v Polsku, whisky ve Skotsku a zkušenosti získával i z evropských vinařství. Na počátku 90. let pak působil jako master blender ve firmě Varela Hermanos, což je producent známého rumu Abuelo. Po této bohaté čtyřicetileté kariéře, ve věku již důchodovém, vytvořil Zafru Master Reserve, jako svůj doposud poslední významný počin. Při testování jsem přímo srovnával s mým oblíbencem rovněž z Panamy, Abuelem 12y. Shrnutí: V přímém testu Zafra dokázala porazit Abuelo o jeden bod ve vůni, ovšem v chuti zaostala, a ani skvělá dochuť Zafry s tím už nic nenadělala. Přesto je to výborný rum, ostatně jako všechny čtyři, které jsem v minisériii testoval. Ať už se jednalo o nevšední a originální Arcane Extratoma, Zayu, která byla skvěle vyvážená, chuťově nejlepší z celé čtveřice pak Atlantico Private Cask, nebo nejlépe vonící Zafra Master Reserve, ani s jedním nešlápnete vedle a záleží na tom, co preferujete. I love this rum, but just wonder if it might not be even better if it hadn't spent quite so long in wood. The complexity and dryness from the oak is very appealing, and makes a welcome change to my preferred full rich, sweet fruit. The oak does tend to dominate a little too much, but the rum is smooth and complex if lacking a little length on the finish. But overall has a sophistication that most rums just don't have. A great bottle for those who appreciate aged rum. Smells very good, first sip is excellent. Soft taste, lasts long. Excellent and maybe favourite sipper. Perfectly balanced! Now this is some very balanced premium rum, a 21 yo Panamanian master reserve. The nose: sweet, molasse (brown sugar). The flavour reminds me a somehow of the Diplomatico reserva exclusiva, yet a bit less sweeter and more complex in taste. The finish is not so strong, a gentle light burn. All in all, a very good rum! Has been on my wishlist for a long time so was pleased to receive it for Xmas. As its 21 yrs old i poured a double dose into my Glencairn glass and left it for 25 mins on the bench. On the nose i get caramel , molasses and wood , lots of wood. This is a smooth , dry sipper that seems very well constructed. Tastes smokey with some leather , oak and plenty of Bourbon flavour which im not a great fan of..
Nice gentle burn in the mouth but no real burn in the throat. I get some molasses on the nose mixed with a hint of bananna. Not a strong or overpowering aroma - it is kind of subtle, very pleasant. Initial hit brings out the lingering flavor of the bourbon, blends into oak flavors. Other reviews comment on strong oak notes - I dont get that. It is there, but not overpowering. It transitions into a sweet back end of molases before tailing off. Finish is a bit weak, i wish it had more. Overall a great drink. Smooth, nothing that is overpowering, complex enough to be really enjoyable, simple enough to drink neat pr over some ice. Definitely will keep a bottle in my cabinet. Very smooth, perfectly balanced. Very reminiscent of a good scotch. Would not have bought it due to the price but it just so happened to have been on sale. It is aged in ex-bourbon barrels. It is not as sweet as other rums with is something I greatly enjoy. I sampled this at the same time of the Plantation XO 20th Anniversary, and although the Plantation won the rum battle, this is still an excellent rum! Zafra, like most Panama rums, focuses on the smooth velvety finish, versus have a strong flavor. After all, it's distilled by the master himself, Don Pancho! If you are huge Ron Zacapa fan, this is very similar in flavor and finish. If you are fan of Don Pancho 8 year, this will lack some wood flavor substance. Rich toffee, exotic fruit and spice. Very minimal oak flavor and smooth finish. I would buy this for someone who is looking to get into rum sipping. Every time I pour a glass I feel amazing. Looks very professional and tastes the same. Good value too. Very complex flavour, beautiful stuff. This is the perfect rum for those bourbon and/or scotch drinkers who don't want to be bombarded with the overt sweetness and sugar of some rums such as Diplomatico Reserva and Zaya. Don't get me wrong, it still has a lot sweetness but it's muted by the bourbon barrel aging and goes down very easily. I'm really enjoying this at the moment as my nightly sipper. Smart choice, this rum is perfect to start a night party! Smooth, balanced, nice vanilla notes, high complex bouquet. The nose is fragrant with some spice. When you swallow you definitely get a clear bourbon taste that only lasts for two seconds. The finish is long and very nice with flavors of vanilla and toffee. This would have probably been a perfect sipping rum if it weren't for the bourbon. On the other hand, this is maybe perfect for bourbon drinkers new to rum. Was recommended to me by a friend. Very good and found it a tad nicer than Diplomatica Reserva Exclusiva. Has a little sweetness, but nice flavor and burn. After a glowing review here, I decided to give it a try. I was not disappointed. Quite smooth and somewhat complex, however I noticed a heavier burn on the aftertaste. Another one off the wish list; a shout out to wifey for grabbing me two bottles in South Beach. This was on my list for years and I'll admit I had lofty expectations. It reminds me of a cross between angostura 1824 and matusalem 15. Now I do like both of those but I guess I was expecting something different. If I wanted to impress a buddy with an amazing 21 year old rum I would probably turn to appletons or el dorado before this one. Still; this one is not without its charm.